Fenton Rose Green glass handkerchief holder. Vintage display. Fenton milk glass oval covered butter dish. 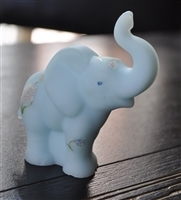 Fenton Satin blue elephant, hand painted with tag and sign by T. Watson. Cutshaw hand painted glass vase by Fenton.